The luck of the Irish is a popular theme with players who fancy their chances at getting their hands on their very own pot of gold. This is why at Slot Games, we have plenty of Irish themed slots for you to choose from, each of them dripping with the stereotypical Irish-isms that you'd expect! 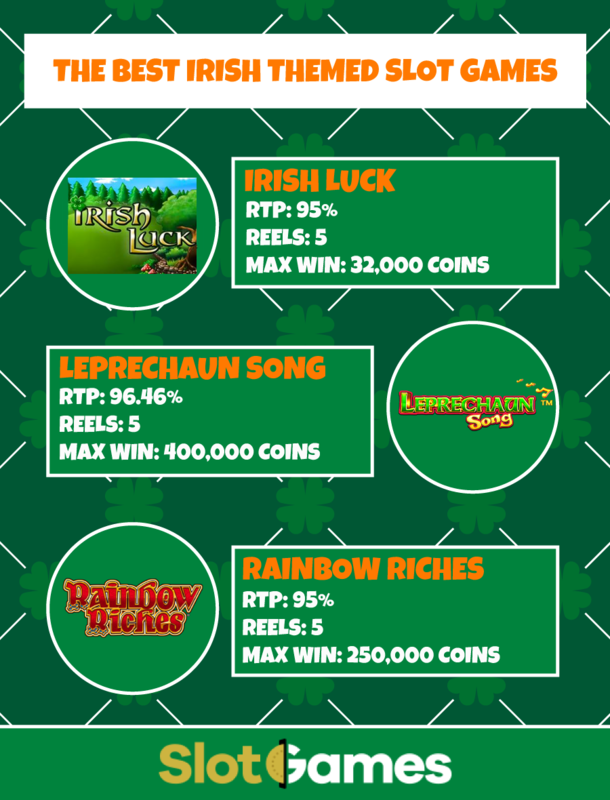 If you're searching for an Irish slot, take a glance at our infographic below which presents three of our best Irish themed slots. The first slot on our list is one of the most popular Irish themed slots out there which has enjoyed long lasting popularity. Rainbow Riches was created by Barcrest and subsequently there have been many variants of this game released to capitalise on the success of the original title. This slot comes with 5 reels and 20 paylines and players can bet a maximum of £400 per spin! Rainbow Riches has all of the traditional Irish theme elements including the rainbow in the background, the wishing well and of course, the leprechaun. It also comes with some exciting bonuses including the Pots of Gold bonus, the Wishing Well bonus and the Road To Riches bonus! Don’t miss out on this exciting game from Barcrest and the others in the series, including 'Pick 'n' Mix' and 'Reels of Gold', all of which are available through our all games page. Our next top Irish themed slot is Irish Luck which comes from Playtech. This game covers the Irish theme using a different angle with items such as the horseshoe, the harp and other typically Irish items appearing rather than leprechauns and rainbows. Playtech have added 5 reels and 30 paylines with a huge maximum bet of £1,500 per spin! Players are sure to love this slot as there is a massive 10000x jackpot up for grabs and that is a lot of gold! If this isn’t enough for you then make sure to check out the Gold Pot Free Spins feature which could get you a total of 33 free spins and a huge 15x to make use of! This game should definitely make the list of go-to Irish slots. It wouldn't be fair to make a list of Irish slots without adding Leprechaun song. This exciting slot takes you on a trip to the Emerald Isle where you’ll find everything from pints of beer to a pipe and a leprechaun’s hat on the reels. Leprechaun Song is a slot game from Pragmatic Play and comes with 5 reels and 20 paylines. There are a few bonus features which make this game even more exciting including the Leprechaun Song bonus which can award you with free spins, a coin collector or giant symbols! There are also some amazing randomly triggered features including the Pick A Fiddle feature which will have you choose a fiddle to win a cash prize! Leprechaun Song is a great game with huge winning potential so make sure to take a spin today to see what you can win! Now that you know about our top 3 Irish themed slot games, all you need to do is login and play here at Slot Games.